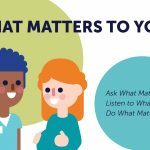 With “What Matters to You?” now a year-round initiative, we have been continually reaching out to patient and health care partners for their experiences with this important question. We chatted with Erin Muxlow from the Victoria Heights location of Good Samaritan Canada, an assisted living facility in New Westminster, about how it has influenced her work, especially since the annual international celebration of “What Matters to You?” Day was just this past week. Erin is a health care aide at Good Samaritan, where she works closely with the residents. Erin told us that she has been completing her “What Matters to You?” bingo card and says that the question is central to her work because it is an icebreaker that gets the conversation started. To extend the ice metaphor, Erin says “What Matters to You?” helps uncover the submerged part of an iceberg. Not everything doctors need to know is easily visible on the surface, and asking “What matters to you?” can help reveal those hidden feelings and concerns a patient may have about their health. Erin commented that patients might not know how or when to ask questions to their doctors, and conversations around “What Matters to You?” open up the channel for good communication, which increases the quality of care. Though it might seem at first to be more time-consuming to ask more questions to patients, committing to asking the question more frequently can even end up saving staff time in the long run! “It keeps them in the know instead of assuming to know,” Erin said. Erin spoke of her co-workers’ experiences with “What Matters to You?”, remembering a recent time when a co-worker asked the question in a group session with seniors at Good Samaritan. Seniors often face isolation and loneliness in care facilities. The residents were a bit surprised by the question at first, but soon began to build off one another’s responses, suggesting that they needed a space where their concerns felt validated. They came to realize that their thoughts around their care were shared by others. Importantly, each senior had the chance to speak without interruption, and felt more understood as a result. Erin commented on the success of the “What Matters to You?” materials, such as the stickers and buttons. One resident approached Erin right away at the outreach booth where she was passing out materials this year, and said that she remembered the outreach at Good Samaritan last year around this time. The resident then began helping with outreach too! She answered questions from newer residents about what “What Matters to You?” is all about, passing on her personal experience with the initiative and teaching her fellow residents. 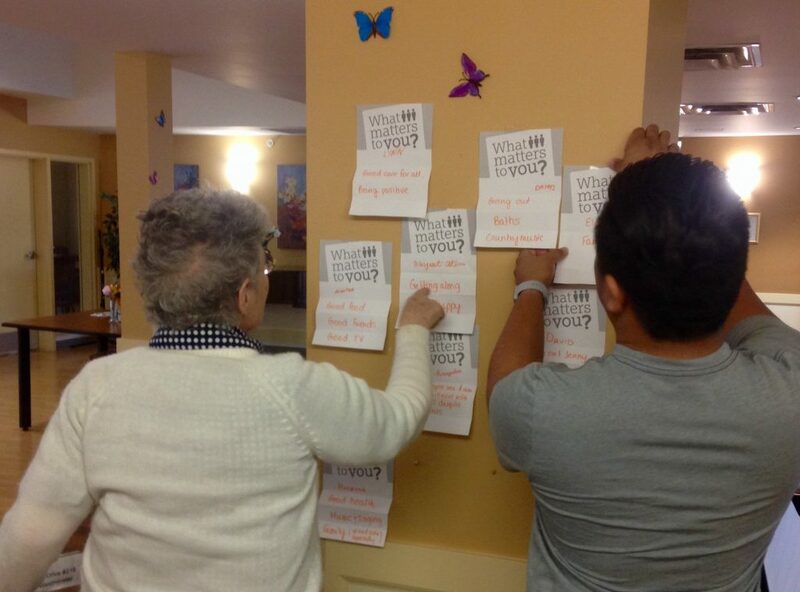 As well as the outreach booth, residents are exercising their creativity with their responses: they are making crafts with their “What Matters to You?” responses that will then be put up on the care home’s walls. 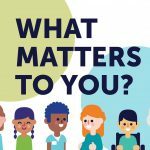 Staff are also getting into the spirit of the day, as they are competing in a friendly contest to win a “What Matters to You?” t-shirt for the first person to get three patient responses. The staff and patients at Good Samaritan are showing just some of the many ways this important question can be integrated into everyday practice. For more information on how to do this yourself, watch our recent video. This entry was posted in Health Care Partners and tagged Fraser Valley & Lower Mainland Region, Health Care Partners, Patient engagement, What Matters to You. Bookmark the permalink.